On February 14-17, 2011, the team of the Institute of Sustainable Education (ISE) from Daugavpils University participated at the international conference “School and Community Interactions” which was held in University of Augsburg (Germany). The Institute was represented by its director Dzintra Iliško, vice dean of the Faculty of Education and Management Ilona Mičule, editor-in-chief of the Institute’s scientific journals (JTEFS and DCSE) Astrīda Skrinda, as well as second year doctoral students in pedagogy Inga Gedžūne, Ginta Gedžūne and Eugeniusz Switala. During the conference ISE team gave three presentations that summarised the current results of doctoral research, as well as presented the Institute’s experience in enhancing international partnership and research for education for sustainable development. 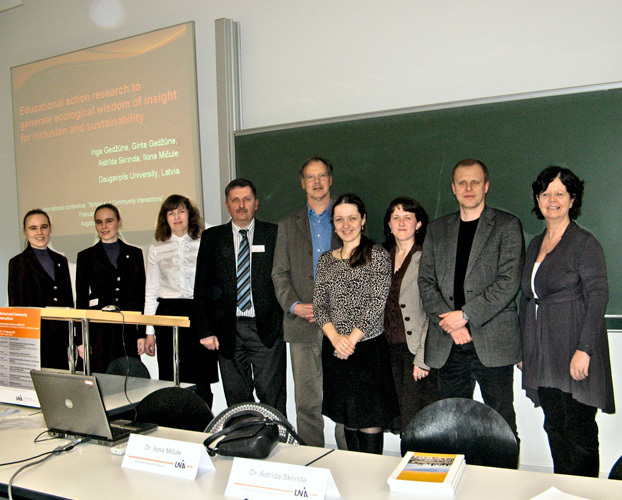 On February 14-17, 2011, the team of the Institute of Sustainable Education (ISE) of Daugavpils University participated at the international conference “School and Community Interactions” which was held in University of Augsburg (Germany). The Institute was represented by its director assoc. prof. Dzintra Iliško, vice dean of the Faculty of Education and Management researcher Ilona Mičule, editor-in-chief of the Institute’s scientific journals (Journal of Teacher Education for Sustainability and Discourse and Communication for Sustainable Education) researcher Astrīda Skrinda, as well as second year doctoral students in pedagogy Inga Gedžūne, Ginta Gedžūne and Eugeniusz Switala. During the conference ISE team gave three presentations that summarised recent research results about the potential of educational action research in exploring the issues pertaining to sustainability in teacher education, as well as presented the Institute’s experience in enhancing international partnership and research for education for sustainable development. One of the highlights of the conference was the annual meeting of ENERCE consortium (European Network for Excellence in Research on Citizenship Education) where opportunities for future cooperation were discussed and suggestion was extended to sign an Erasmus cooperation agreement between University of Augsburg (Germany) and Daugavpils University (Latvia). Doctoral students’ participation in the conference was supported by ESF project “Support to Implementation of Doctoral Studies at Daugavpils University”, agreement No. 2009/0140/1DP/1.1.2.1.2/09/IPIA/VIAA/015.